LIKE App, a short video platform and mobile app with body recognition special effects, has introduced globally the first augmented reality (AR) and artificial intelligence (AI) feature called ‘Shaping Magic’. Expanding its reach to more LIKE users, the new feature is available for free enabling video creators to effortlessly modify the shape and form of body features from head to toe. In India, various entertainment mobile apps offer multiple face modification features and these apps are very popular among the youth who keep experimenting with their photos/videos. 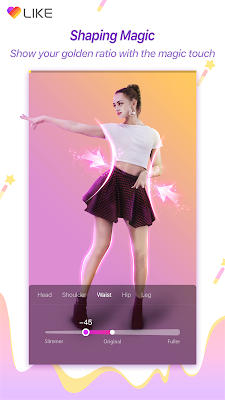 LIKE’s Shaping Magic is designed to not only leverage this trend but to also offer a much more advanced feature for youth to experiment with.Based on AI Technology, Shaping Magic feature is an innovation in video application field. The effect is entirely customizable by the end users because it enables users to adjust the degree to which their body outline/parts are modified and also re-shape individual body elements. In other words, the LIKE users can adjust their body silhouette individually. Hence, it helps in creating the perfect video by their own definition of beauty – which they control. LIKE’s Shaping Magic feature was introduced a few days back, and today it has become one of the top features on LIKE being used by more than 25 million users in India, and 50 million users globally. The app has also witnessed significant growth in number of downloads post launch of Shaping Magic. Such video platform and special effects app with cutting-edge technology including AI, AR and independently innovated body recognition enhances users to create videosof their favorite heroic / fiction characters comparable to movies.